Guildeless people can't find our guild. As every challenge starts people are changing guilds in-between. 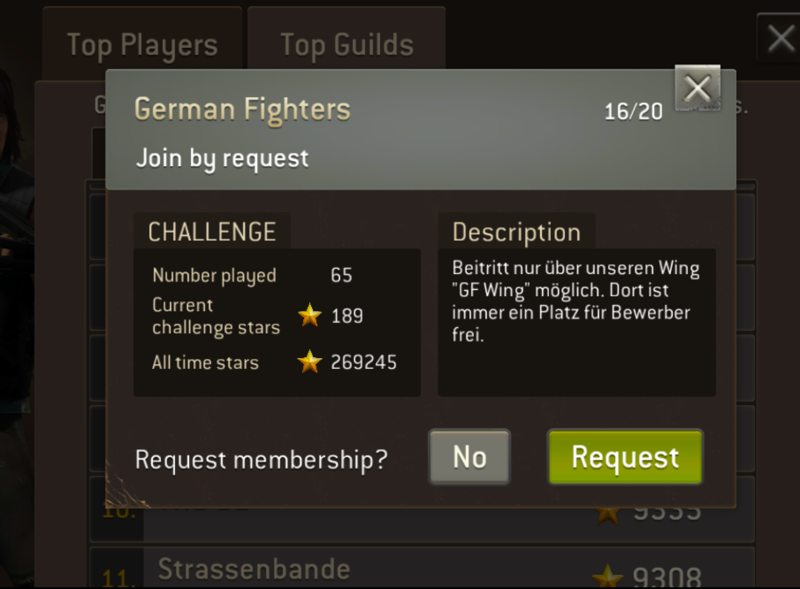 We have guildless people that can't find our Main Guild "German Fighters". As the Leaderboards are removed during the non challenge times they can't find us via the Search function. Special Keywords don't help. Clear "Cache" on iPad is not possible as far as I know. @JackBauer could you post a screenshot of your guild name with description? Body is 3 characters too short. @JackBauer , the special keyword only works for the beginning of the description. Our guild is Aegis, there are multiple guilds with the name, if you search for Protect & Serve, 2 guilds show up and our guild is the only Aegis. I would suggest a unique/ special keyword. Works as described. Can be closed. Glad to help. Closed. It's not an idea solution but that's what works now.